As in 2013, Pew Research asked users of each platform how often they engage with the site, whether on a daily, weekly or less frequent basis. Facebook users continue to be highly engaged, while the proportion of daily Twitter users decreased, and users of Instagram, Pinterest and LinkedIn mostly log on with similar frequency compared with last year. Facebook users are highly engaged with the platform. Fully 70% say they use Facebook daily (including 45% who do so several times a day), a significant increase from the 63% who visited daily in August 2013. Some 17% visit Facebook weekly, while 12% of users log on less often. Most Facebook users are actively engaging with their networks on the site. As opposed to simply reading or viewing content, 65% of Facebook users frequently or sometimes share, post or comment on Facebook. Almost half (49%) of Instagram users are on the platform daily, with 32% who say they go on Instagram several times a day. Another 24% say they check in weekly, while 26% visit Instagram less often than that. There were no significant changes since August 2013 in the proportion of Instagram users who use the site with varying degrees of frequency. Some 36% of Twitter users visit the site daily, with 22% saying they go on Twitter several times a day. Another 24% say they visit a few days a week, while 40% say they check Twitter less often. The proportion of Twitter users who visit the site daily is a significant decrease from the 46% of users who did so in August 2013. Some 17% of Pinterest users visit the site daily, including 9% who visit several times a day. 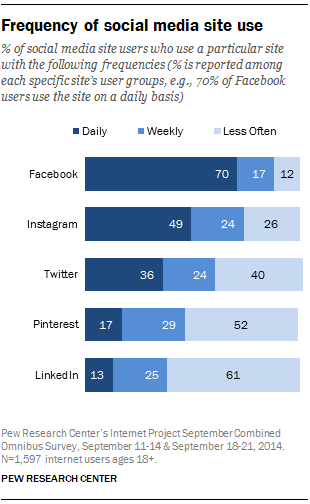 Some 29% of users go on Pinterest weekly, while 52% say they visit the site less often. There were no significant differences since 2013 in the proportion of users who use Pinterest with varying degrees of frequency. Some 13% of LinkedIn users visit the site every day, including 7% who say they visit LinkedIn several times a day. Compared with August 2013, more users log on less often. The proportion of LinkedIn users who visit the site weekly dropped from 34% in August 2013 to 25% in 2014. Likewise, 61% of LinkedIn users say they visit the site every few weeks or less often, compared with 52% who said so in 2013. Today, more than half of internet users (52%) use two or more of the social media sites measured (Facebook, Twitter, Instagram, Pinterest, and LinkedIn) compared with 42% who did so in 2013. Facebook remains the most popular platform for those using just one social media site—fully 79% of those who use just one site report using Facebook. As in 2013, a significant majority of Twitter, Instagram, Pinterest and LinkedIn users say they also use Facebook, more than any other site. At the low end, 86% of LinkedIn users are also on Facebook. At the high end, 94% of Instagram users use Facebook (Instagram’s parent company). Twitter, Instagram, Pinterest and LinkedIn than there were last year. 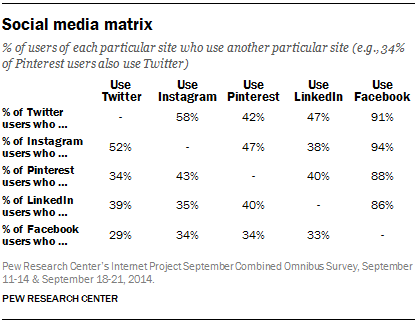 Similarly, there are more LinkedIn users who use Twitter, Instagram and Pinterest than there were in 2013. Finally, there are more Pinterest users on Instagram and LinkedIn than in 2013. 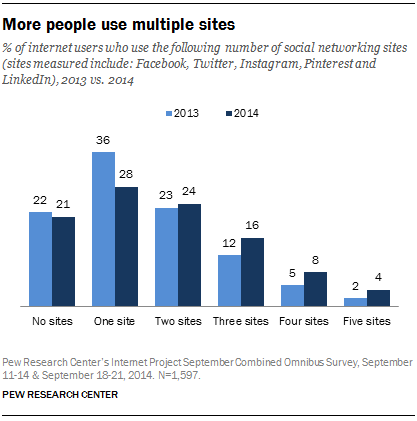 These increases likely reflect the overall trend toward multiple-site use described above. Turning to sites other than Facebook, a significant level of overlap exists between Instagram and Twitter users—58% of Twitter users also use Instagram, and 52% of Instagram users also use Twitter. Among non-Facebook sites, this is the highest rate of “reciprocity” between user groups measured.